LOS ANGELES, Dec. 19, 2017 /PRNewswire/ -- Claremont McKenna College's Rose Institute of State & Local Government today released the 22nd annual Kosmont-Rose Institute Cost of Doing Business Survey. The Rose Institute gathered data on municipal and county taxes, fees, and demographics from selected cities in the Western United States. The 2016-2017 edition of the Survey takes a close look at the cost of doing business in California in the most recent past calendar year, along with eight other western states that many companies view as possible alternatives to California (Arizona, Colorado, Nevada, New Mexico, Oregon, Texas, Utah, and Washington). Rankings for each city are divided into one of five "Cost Ratings" groups: Very Low Cost ($), Low Cost ($$), Average Cost ($$$), High Cost ($$$$), and Very High Cost ($$$$$). California dominates the list of the 20 most expensive cities, with a total of 11 cities - eight in Southern California and three in the San Francisco Bay Area. Los Angeles and the San Francisco Bay Area are the two most expensive metropolitan areas in the western United States. Seven out of the twenty most expensive western cities are in Los Angeles County: Bell, Beverly Hills, Culver City, El Segundo, Inglewood, Los Angeles, and Santa Monica. Texas stands out as a low-cost state, with seven cities on the list of 20 least expensive western cities. Although California has several low-cost cities, only one is represented on the 20 least expensive western cities list (City of Moorpark, located in Southern California). The Survey's findings indicate that the Bay Area and Los Angeles are the two most expensive metropolitan areas in the western United States, followed by Portland. The three most expensive cities located in the Bay Area are San Francisco, Berkeley, and Oakland. All three cities have high utility rates of 7.50%. San Francisco ranks first on the list with the highest business license fees found in the Survey. For example, the business license fee for a medium- sized retail business in San Francisco (typically a store of roughly 5,000 to 15,000 square feet with approximately 25 to 75 full time equivalent employees) is $13,500 a year. 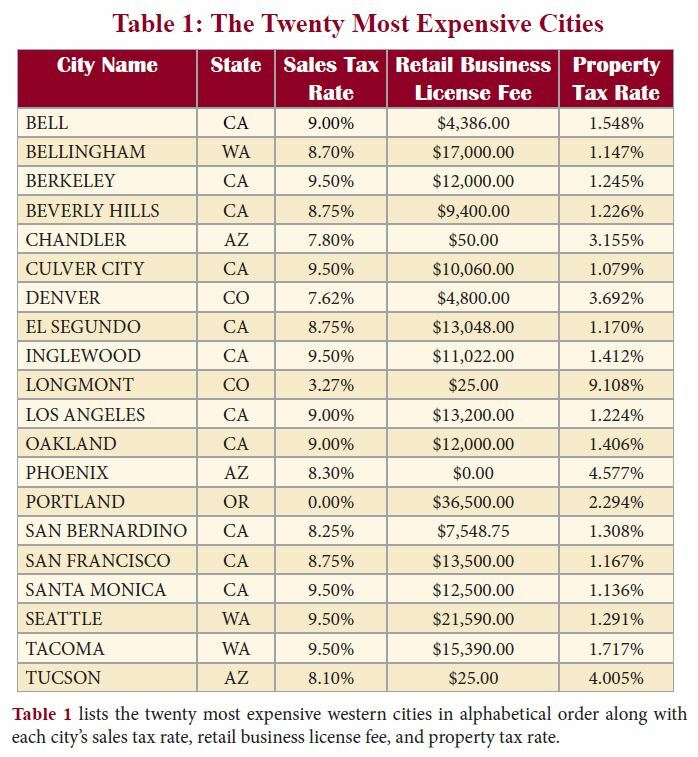 Berkeley and Oakland also have high business license fees at $12,000; the lowest business license fee on the list of twenty most expensive cities is $0 (Phoenix, Arizona). Seven out of the twenty most expensive cities are in Los Angeles County: Los Angeles, Santa Monica, Culver City, Inglewood, Beverly Hills, Bell, and El Segundo. In these cities, a medium-sized retail business would pay between $4,386 and $13,200 a year in business license fees. Overall, Portland has the highest business license fee of $36,500 and a utility tax rate of 5% for all services excluding cellular. The concentration of expensive cities in major metropolitan areas limits options for businesses who desire less expensive business environments while retaining access to key markets, trading ports, and other resources. There is some legislative momentum in California to generate business opportunity and investment. Since the dissolution of redevelopment in 2012, California has introduced several new tax-increment financing and special districts that provide opportunity for the private sector to work with cities and counties to install sustainable infrastructure, and develop housing and commercial projects that respond to California's climate-action goals and housing affordability challenges. Initially targeting sustainable infrastructure and public/private transactions, Enhanced Infrastructure Financing Districts (EIFDs), via SB 628, were signed into law in September 2014. Then in September 2015, with a greater focus on disadvantaged communities and affordable housing, the state authorized the formation of Community Revitalization Investment Authorities (CRIAs), via the passage of AB 2. Most recently, Governor Brown and the State Legislature further demonstrated a commitment to addressing California's housing issues through the passage of the Neighborhood Infill and Transit Improvements Act (NIFTI - AB 1568) and the creation of Affordable Housing Authorities (AHAs - AB 1598); both provide additional financing structures for affordable and workforce housing using property tax increment and sales tax allocation. California's special financing districts (EIFDs, CRIAs, NIFTIs, AHAs) have potential at the local level to create collaborative public and private sector investment in projects and sustainable infrastructure. These districts are starting to be formed. As of November 2017, EIFDs have been formed by the cities of West Sacramento, San Diego, and La Verne (Los Angeles County). Numerous local governments are evaluating the feasibility and benefit of EIFDs and CRIAs in their jurisdictions. Over time, as these districts proliferate, business investment and economic development opportunities will be created as the private sector focusses on getting city hall to use tax increment generated by new development projects within a tax increment district, to pay for infrastructure that supports collateral private sector investment in the district. In another business-supportive move, California finally appears to be approaching housing production as an economic development imperative. Recognizing that job rich locations such as the Bay Area are losing employers due to a lack of housing, on September 29, 2017, Governor Jerry Brown signed a collection of 15 housing-related bills which aim to increase the number of housing units in the state by streamlining the development process, creating financing districts, monitoring/reviewing municipal land use approval processes, and charging new real estate transaction fees to create local revenues for affordable, supportive and transitional housing and emergency shelters. Despite legislative efforts to increase the number of affordable units within the state, California's housing affordability issues are not going away. About 100,000 new homes need to be built each year, in addition to what is already planned, simply to satisfy California's population growth. While in the aggregate, these new housing bills are an attempt to expand statewide housing production, they represent a double-edged sword for the cost of housing projects. Roughly half of the new housing statutes pile on regulations for the public and private sectors. Several of the new statutes add to the cost of housing development by requiring prevailing wage, while only three of the bills create new revenue sources for housing. A new proposed ballot initiative, which could find its way onto the 2018 ballot, seeks to combat the State's housing affordability gap through the expansion of rent control. The proposed ballot initiative would repeal the Costa Hawkins Rental Housing Act (initially enacted in 1995), which limits the ability of cities and counties to enact rent control laws. If repealed, California cities like Los Angeles could decide to apply rent control to new units (for example, current Los Angeles rent control can only be applied to units built prior to October 1978). Repealing the Costa Hawkins Act is a lightning rod for residential real estate owners who argue that it would further exacerbate California's housing crisis by raising the uncertainty of the State's housing market, and deterring new construction. Based on foreseeable ballot measures and recent legislation, there is nothing on the horizon that appears to improve California's standing as a facilitative or cost-effective place to conduct business. Based on the 2016-2017 Kosmont-Rose Cost of Doing Business Survey, California cities continue to rank among the most expensive cities in the country to do business. It is unlikely that California will relinquish its status as a "high cost" State anytime soon. The State's recent efforts to install new sustainability and housing districts that deploy tax increment are a small step in the right direction; but more is needed. 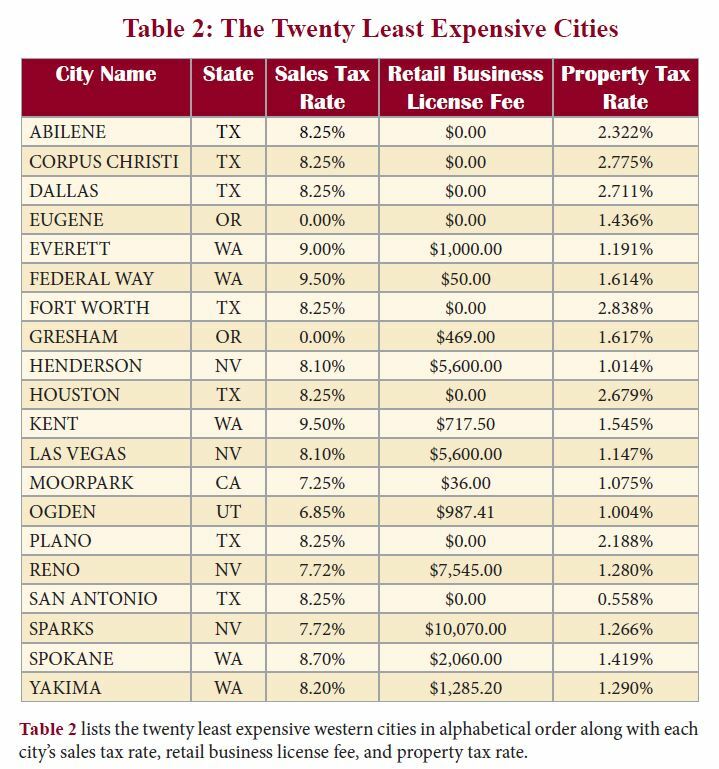 Please see associated images for the twenty most & least expensive cities in the west in 2016-2017.